Rupert Murdoch’s publishing empire has been built on a pattern of viciousness and deceit–aided at every step of the way by the politicians. I MET Eddie Spearritt in the Philharmonic pub overlooking Liverpool. It was a few years after 96 Liverpool football fans had been crushed to death at Hillsborough Stadium, Sheffield, on April 15, 1989. Eddie’s son, Adam, aged 14, died in his arms. The “main reason for the disaster,” Lord Justice Taylor subsequently reported, was the “failure” of the police, who had herded fans into a lethal pen. Three days after the disaster, Kelvin MacKenzie, Rupert Murdoch’s “favorite editor,” sat down and designed the Sun front page, scribbling “THE TRUTH” in huge letters. 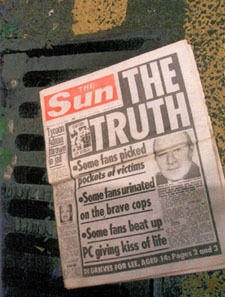 Beneath it, he wrote three subsidiary headlines: “Some fans picked pockets of victims”…”Some fans urinated on the brave cops”…”Some fans beat up PC giving kiss of life.” All of it was false; MacKenzie was banking on anti-Liverpool prejudice.